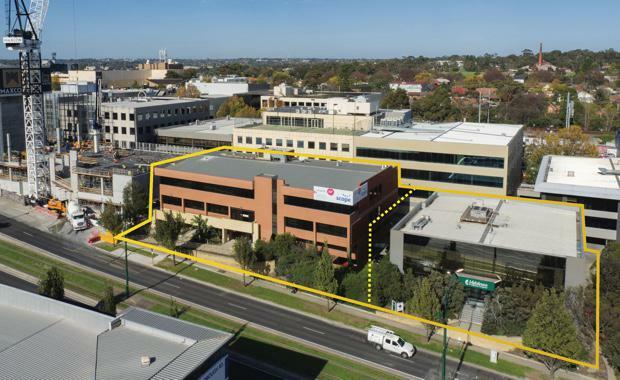 Neighbouring not-for-profit organisations – Navy Health and Scope - have sold their adjoining Box Hill properties for just over $30 million to a single Chinese developer, setting a new record of almost $12,000 a square metre of land. According to Savills’ State Director Clinton Baxter, who brokered the sale of the 2650 square metre site with Director, Nick Peden, and Associate Director, Jesse Radisich, the Expressions of Interest campaign generated intense competition between several Chinese bidders for the properties. "The sale is a tremendous endorsement of the Melbourne and Box Hill development market placing Box Hill property on a par with land rates being achieved close to Melbourne’s CBD, and demonstrating the development powerhouse that Box Hill has become in recent years," Mr Baxter said. "The intense competition from prospective purchasers reflected an ongoing confidence in what has been a tremendous market in Melbourne generally, and in areas like Box Hill specifically, over the last few years. "Ongoing strong population growth, the RBA’s increasingly likely reduction to official interest rates in August along with a stable political environment will further drive a very healthy market,’’ Mr Baxter said. Mr Peden said Savills’ co-ordination of the sale of the non-related owners assets had seen the vendors realise a premium value in the millions that could not have been achieved in separate sales. This was an astute decision by two vendors who had decided they could no longer justify occupying such valuable landholdings and they were duly rewarded. The vendors were also fully cognisant of the tremendous strength of the Box Hill market, one of the strongest localised areas anywhere in Australia, and the opportunity to sell in the wake of Savills’ successful sale of the adjacent property at 820 Whitehorse Road for $18.18 million late last year at what was a record price,’’ Mr Peden said. Located within Box Hill’s Major Development Precinct, the 826 and 830 Whitehorse Road properties offered a combined site area of 2650 square metres (1,078sqm at 826 & 1,572sqm at 830), a generous 72 metre frontage to Whitehorse Road, as well as rear lane access, and two high quality office buildings with short-term holding income. Mr Radisich said the Commercial 1 zoning, within Box Hill’s Major Development Precinct, allowed for a landmark development with planning advice from Urbis indicating a potential building height of more than 30 levels (STCA) with a potential yield of in excess of 500 apartments. The vendors were both advised by Ernst and Young.